Low-Carb Baked Eggs in Canadian Bacon Cups are a fun idea for breakfast that’s also Keto, South Beach Diet Phase One, gluten-free, dairy-free, kid-friendly, and easy to make! Click here to PIN Low-Carb Baked Eggs in Canadian Bacon Cups! This recipe for Baked Eggs in Canadian Bacon Cups came about when I was hit with of those spontaneous creative cooking urges that pop into my mind, inspired by a package of Canadian bacon I’d purchased from Costco. I thought this was such a fun breakfast idea, and Canadian bacon is tasty and lower in fat than bacon, for anyone who might care about that. I ate mine with one piece of whole-wheat toast to dip into the egg yolk, but if you wanted a low-carb or gluten-free breakfast idea this would also be delicious without the toast. On Fridays I feature my favorite recipes from the past and I’m spotlighting this easy recipe for Five Ingredient Fridays, hope you enjoy! If you’re looking for easy recipes, there are a lot more Five Ingredients recipes on the blog. The first photo is the Canadian bacon I buy at Costco. I don’t bother to cut off the thin rind, but you could if you prefer. You need either Large Silicone Muffin Cups or a muffin pan with large cups to make this successfully. The cups need to be 3 1/2 inches to 4 inches across to fit the 3 pieces of Canadian bacon. Spray the muffin cups with non-stick spray, then put in 3 pieces of Canadian bacon in each and put it in a pre-heated 400F/200C oven for 10 minutes. (Heating the Canadian bacon is important so the egg starts to set as soon as you break it into the cup. Then carefully break one egg into each of the cups. Bake about 14-16 minutes, depending on how firm you like your eggs. Serve hot, with toast to dip into the yolk if desired. 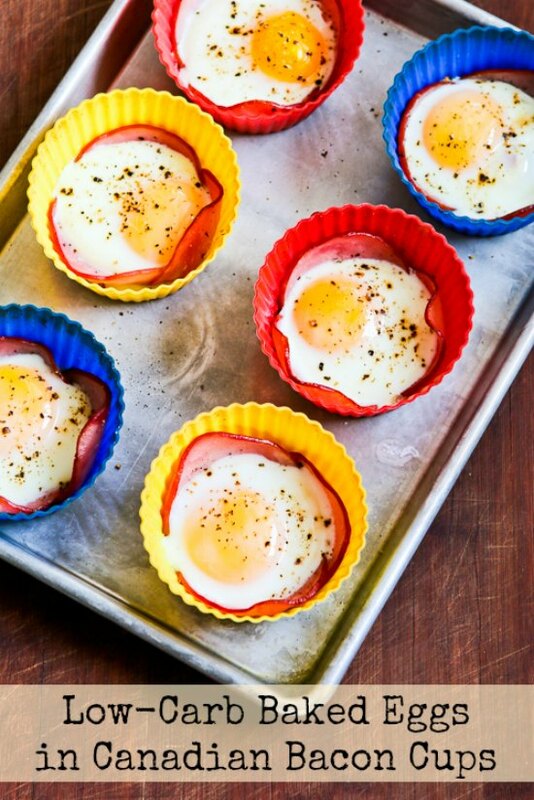 Low-Carb Baked Eggs in Canadian Bacon Cups are a fun idea for breakfast that’s easy to make! Arrange 3 slices of Canadian bacon in each muffin cup, overlapping so the whole cup is covered, and pressing down to shape it to the muffin cup. Bake 10 minutes. 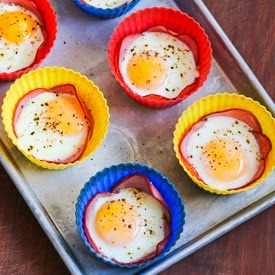 Remove tray or muffin pan from the oven and carefully break an egg into each of the Canadian bacon cups. Season with a little salt and fresh ground black pepper to taste. Serve hot, with toast strips to dip into the yolk if desired. You need Large Silicone Muffin Cups, or a muffin pan with cups at least 3 1/2 inches to 4 inches across to make this successfully. Low-Carb Baked Eggs in Canadian Bacon Cups should be good for most any low-carb or low-glycemic eating plan. Canadian bacon is much lower in fat than ham or bacon, and combined with eggs it makes a good low-breakfast for any phase of the South Beach Diet. If you add the optional toast to dip into the yolk, using whole grain bread, this would be Phase 2 or 3 for South Beach. Can these be frozen and heated up? I know they will probably be better fresh but it's just my husband and I right now and I wouldn't want to just make 2 a day. I haven't tried it but I really doubt they will freeze well, sorry! These are so cute, I love this idea! Great breakfast idea. It's been a while since I had Canadian bacon – for a while I was eating so much of it, I grew tired of it. Thanks Lydia, Karen, and Jeanette. These were fun to make and eat. And I love the silicone cups in general but this bigger size is really versatile. Love how fun and easy these are Kalyn – those silicone cups are a great idea! These look like so much fun! What a great way to serve bacon and eggs!